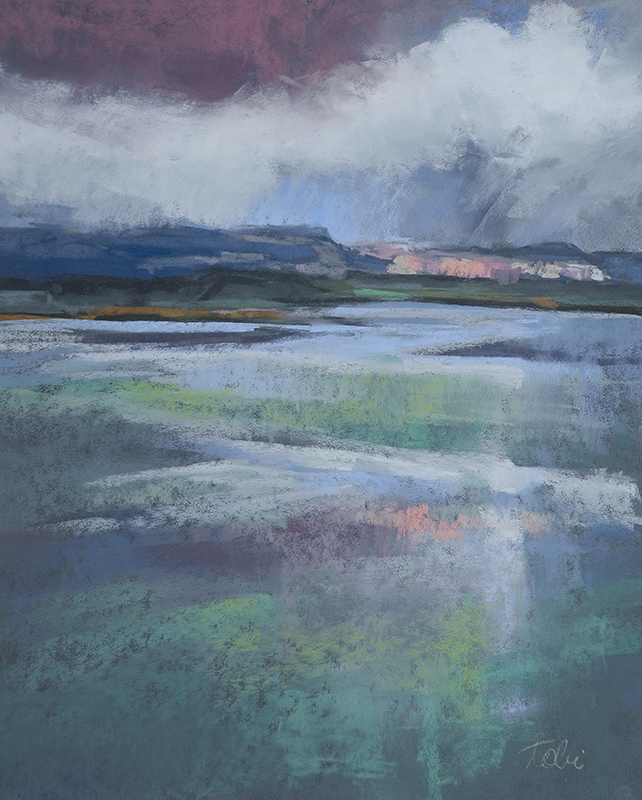 Award-winning plein air pastel artist Tobi Clement, paints the expansive landscapes and ethereal quality of light that is only found in New Mexico. She is attracted to the transitory qualities of the skies and sweeping vistas, inspired by their ever-changing light and moods. The immediacy of the pastel medium, amplified by her own boundless energy, allows Tobi to capture the fast-changing effects of light, and the dynamism of the New Mexican skies. This local artist has been an active member of the Plein Air Painters of New Mexico for five years and participated in their annual juried events; the Santa Fe Plein Air Festival and National Members show. She has been juried into National Pastel Society shows throughout the USA and is an active member in the New Mexico Pastel Society and Northwest Pastel Society. Tobi’s work has been featured in the Pleinair Magazine in recent editorials that focused on skies and storms. Southwest Art Magazine will feature Tobi as an Artist to Watch in the 2018 May Issue. Opening reception for The Sky Above Us is on July 6, 2018 from 5:00 pm to 7:30 pm. Show runs until the end of July. View more of Tobi's work on her website.